Arthropods form the largest phylum of living organisms and account for more than three out of four species of animals. Arthropods include insects, centipedes, millipedes, crustaceans, arachnids and others. The Emperor Scorpion can grow up to 6 ½ inches long. It is usually docile and calm, but if agitated, scorpions can sting with their tail. 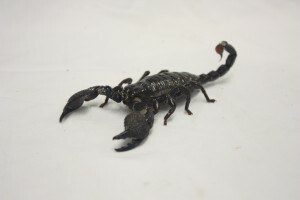 All scorpions have a certain amount venom; most people are not affected by the sting of the Emperor Scorpion. Although some people may have allergic reactions to the venom, like being allergic to bee stings, so it’s best to keep your distance if you are not sure. You can find our Emperor Scorpions in the Herpaquarium. The female had babies during the winter of 08 – 09. They are getting as big as their parents. 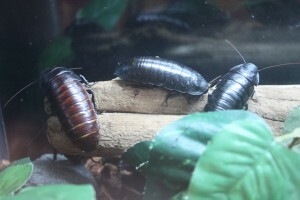 These are the largest of the Cockroach family. They are wingless and will grow to be 2 – 3 ½ inches long as adults. The Hissing Cockroach is wingless. It produces a loud “hissing” sound to scare away predators. They are very common are actually kept as pets. Also known at the Madagascar Giant Hissing Cockroach, it is often used in movies for those creepy scenes we all love. You can find our Hissing Cockroaches in the herpaquarium. The Chilean Rose Tarantula is one of the most commonly imported tarantulas. It is fairly large, hardy, and docile. It can be a tan or brown color with pink hairs. They like to hang out under logs and other natural debris. All tarantula’s have a certain amount of venom. Most people are not affected by the venum, but some are allergic, like being allergic to bee stings. 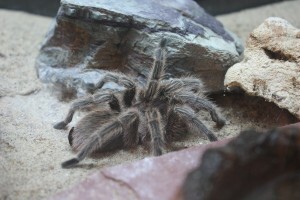 You can find our Tarantula in the herpaquarium.